The Detroit Zoological Society’s (DZS’s) ongoing involvement in the important conservation project Wolves & Moose of Isle Royale – the longest continuous study of any predator-prey system in the world – continued with a recent expedition to this remote island. Isle Royale is located in the frigid waters of Lake Superior. At more than 40 miles long, it is the largest island in the largest of the Great Lakes. This national park is also home to a population of wolves and moose – moose first came in the early 1900s and wolves joined in the 1940s after crossing an “ice bridge” from Canada. For more than five decades, researchers have studied the lives of these animals and their fluctuating populations in order to better understand the ecology of predation and in turn, gain a better sense of our relationship with nature. I recently traveled to Isle Royale with David Anthony, a DZS education specialist, to conduct research for this project. We took the ferry from Grand Portage, Minnesota to the Windigo Ranger Station on the southwest end of the island – the opposite side from where we conducted fieldwork in 2016. Because ice bridges form more rarely between Isle Royale and Canada due to the changing climate, the wolf population at this location has dropped to only two closely related individuals. The Wolf-Moose Project currently focuses on how the moose population is responding to reduced wolf predation and how the forest is responding to the increased moose population. While there is a proposal to reintroduce more wolves, it is a complicated issue in part because Isle Royale is also a national park. The National Park Service is expected to decide on this proposal this fall. Once we arrived at Windigo, we donned our heavy backpacks in a light rain for a 5-mile hike to our first camp, which was situated next to a large beaver pond. It was a cold, rainy night and rather unpleasant, but it was a relief that the next day was sunny and we were able to dry out our clothes and equipment. We hiked 2-3 miles each day, carefully looking for moose bones in the dense forest, traveling up and down ridges and through swamps. On our first full day in the field, we located a nearly complete skeleton with an antlered skull. The skulls and teeth were an especially successful find, because when cut into a cross section, the rings of dentin in the teeth can be counted to age the moose – similar to counting tree rings – which provides important information on the moose population. The bones are also examined for signs of chewing by wolves as well as signs of arthritis – many moose at Isle Royale live longer and are more prone to developing arthritis than moose in areas with more predators. With this information, we then try to surmise the cause and time of death to learn more about when wolves were still predating or scavenging moose. Our team also documented the harmful effects moose are having on Isle Royale’s fir trees. Moose rely on the relatively soft fir tree needles for food during the winter, and in many areas, they have continually browsed the tops of fir trees so they stay short and cannot reproduce. With taller, reproducing fir trees becoming scarce on the island, the over-browsing of the short fir trees is a serious concern. 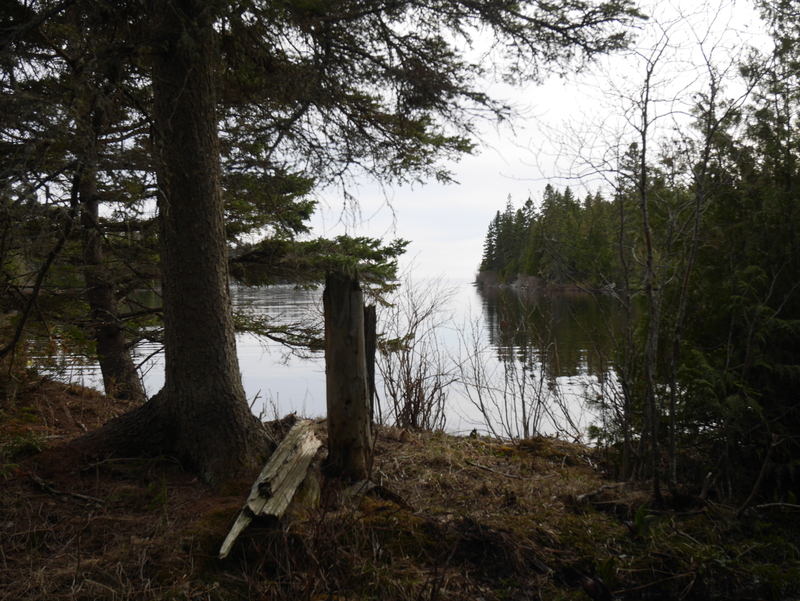 After several days, we hiked to our next camp on the shore of a sheltered harbor on Lake Superior. 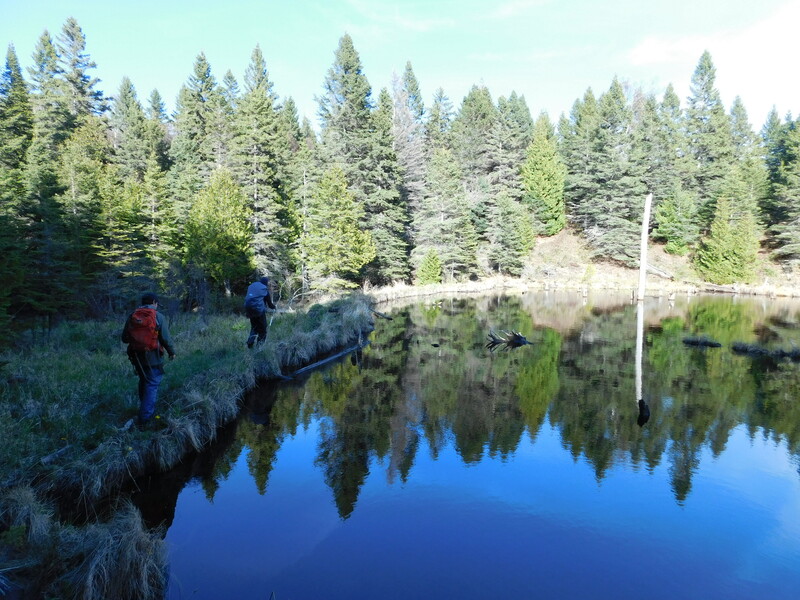 This site was situated next to an active beaver lodge that kept us up at night with tail slapping and the “kerplunk” of beavers diving under water. 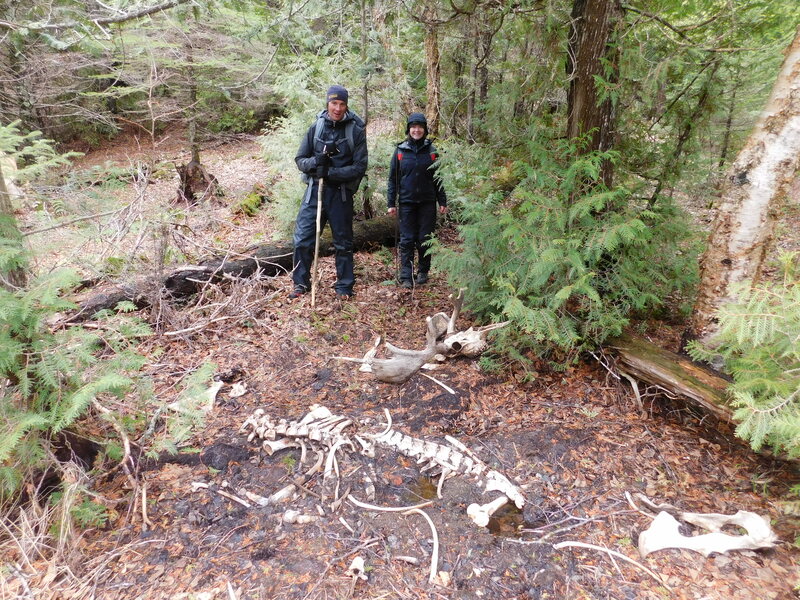 On our next trek, we found another, even larger antlered skull, and there was more clear evidence of wolf predation – or at least scavenging – with chewed-up leg bones found dragged away to shady trees nearby. As we wrapped up our journey, we connected with another group of researchers exploring a different part of the island; both teams returned with moose bones and teeth for examination, marking a very successful field expedition.